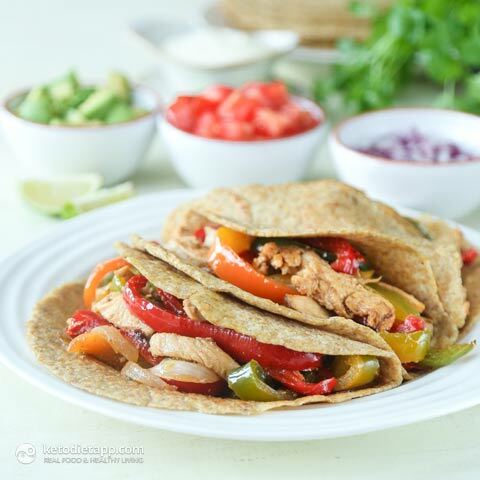 Have you tried chicken fajitas? It&apos;s a great keto meal that takes no more than 30 minutes to prepare! 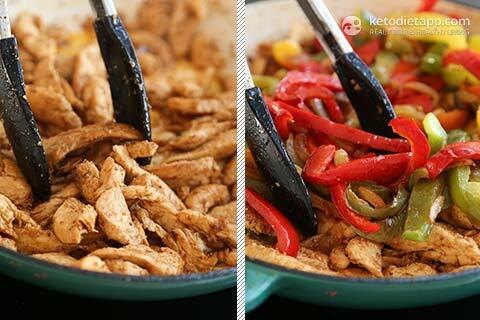 Fajitas are traditionally made with seared skirt steak that is cooked medium-rare and sliced into thin strips. When you use chicken instead of beef, it gets even easier because you don&apos;t need to worry about overcooking it. 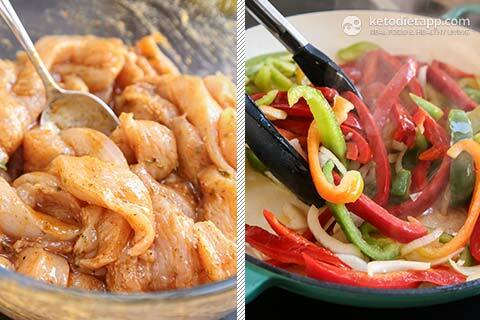 You simply slice the chicken breasts into thin strips and marinate them in spices, lime juice & olive oil. Then you pan-sear them and serve with charred vegetables. I used my Keto Tortillas to wrap the fajitas. 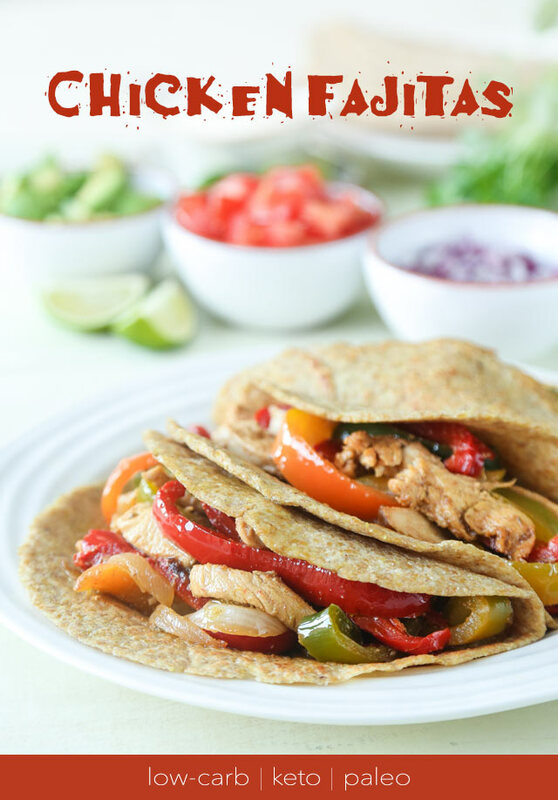 If you haven&apos;t tried them yet, these tortillas are a game changer for everyone following the ketogenic diet. They are perfect for wraps, easy to make and so versatile. In fact, I use the same dough for tacos, tortilla chips, breadsticks and even pizza crust. Macronutrient ratio: Calories from carbs (6%), protein (28%), fat (66%). Nutrition facts from the marinade are counted partially (most of the marinade is discarded). Note: if you don&apos;t have ghee, use duck fat, goose fat, lard or coconut oil. You can learn more about healthy fats in this post. 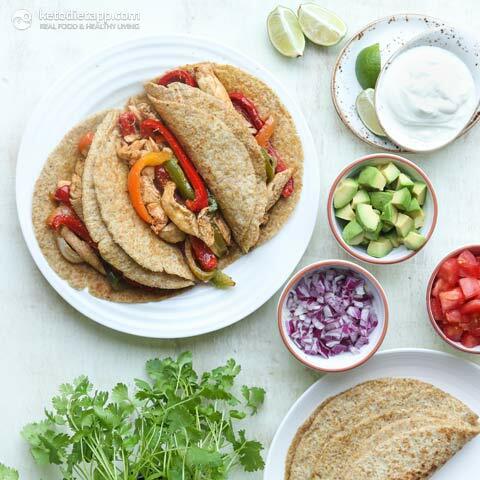 Note: Tortillas are included in the nutrition facts - optional ingredients are not included. Start by marinating the chicken. Slice the chicken breasts into about 1/2-inch (1 cm) thin strips. 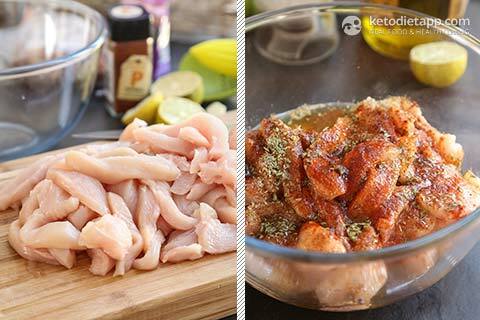 Place the chicken into a bowl and add all the marinating spices: minced garlic, dried oregano, ground cumin, paprika, chipotle chile powder, salt, olive oil and lime (or lemon) juice. Mix until the chicken is covered from all sides, cover the bowl with a cling film and marinate for 30-60 minutes (or overnight in the fridge). When ready for cooking, remove from the fridge and discard the marinade (you need to remove any excess moisture before cooking the chicken strips in the pan). Start by cooking the vegetables. Peel and slice the onion and slice the peppers. Heat a large pan or casserole dish greased with 2 tablespoons of ghee over a medium-high heat. Once hot, add the sliced onion and peppers. Cook until crisp-tender and lightly charred for 5-8 minutes. 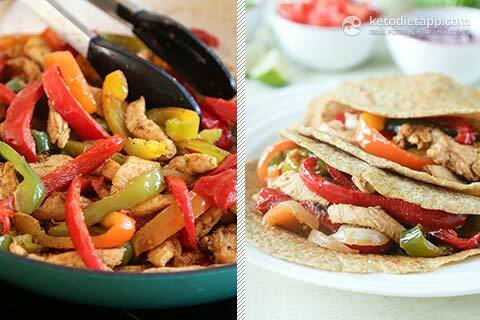 Use tongs or spatula to toss the peppers every couple of minutes while cooking. When done, transfer the peppers into a bowl and set aside. Keep the heat on medium-high. Grease the pan with the remaining 2 tablespoons of ghee and add the chicken slices. Cook for 4-6 minutes until lightly browned, flipping half way through. 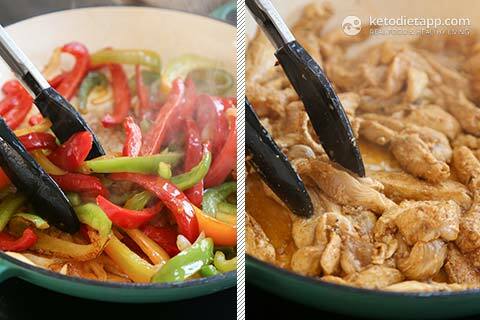 Return the cooked peppers to the pan and heat through for just 30-60 seconds. Then, take off the heat. Serve with Keto Tortillas and any preferred toppings ... ... sliced avocado or Guacamole, chopped tomatoes or Salsa, shredded cheese, sour cream, lime wedges and cilantro. Enjoy! Hi, how long do these keep for as it is just me who will be eating them? I could make less but some of the measurements would be a little off. I'm sorry for the late response! They will keep for 4-5 days in the fridge. The tortillas will keep for up to about a week - or you can freeze them for up to 6 months. Yes it is one per serving but they are quite filling  I only needed one and my partner had two. There are just about 6 g of net carbs per serving (here's why I count "net", especially when the carbs are from vegetables: Total Carbs or Net Carbs: What Really Counts?). There is less than 480 kcal because you won't eat all the olive oil (part is discarded) - I'll fix that and count it only partially. This, in fact will also have an impact on the carb count as part of the spices are discarded as well. Make them every few weeks as love them. I hope you are making another cookbook as over halfway through this one.